I’ve been following a low carb lifestyle for eight months now and can report a twenty-six pound weight loss! I’m happy to be committed to living a healthier lifestyle and watching my sugar intake. It was hard to kick the sugar habit, but I have created a recipe that I can enjoy when I’m craving something sweet to eat! 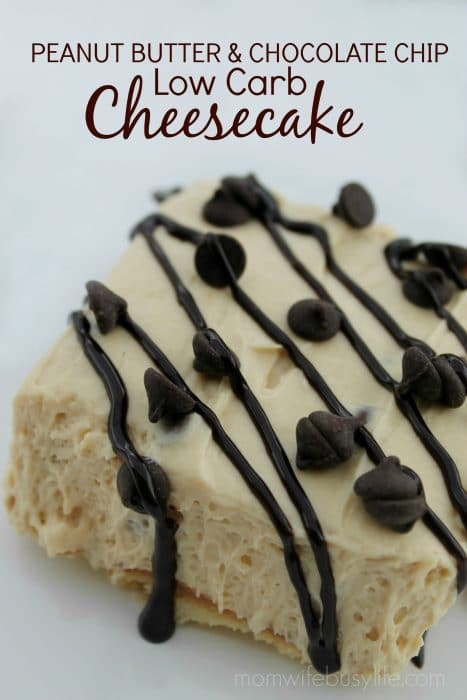 I love chocolate, peanut butter, and cheesecake, so this is the perfect combination to enjoy together if you are watching your carbs! If you are looking for a light and fluffy dessert with the perfect amount of sweetness, this is for you! Combine crust ingredients (almond flour, sweetener, butter) in a mixing bowl and mix well. Mixture will be crumbly. Press crust down into a lightly greased (I use an olive oil spray) 8X8 baking dish. Bake at 350 degrees for about 7-10 minutes or until crust is slightly brown. Set aside and let cool. In a medium mixing bowl , mix filling ingredients (cream cheese, sweetener, peanut butter) with an electric mixer until blended. Add the whipping cream and whip until mixture is creamy and fluffy and a peak forms. Spread mixture onto cooled crust evenly. Sprinkle with leftover chocolate chips and drizzle the chocolate sauce on top before serving! What’s the carb content of this yummy sounding dessert? Before I start drooling too much! You had me at cheesecake., though I’ll be interested to know how the low-carb thing works out. It doesn’t inspire me with faith, but I can be convinced.